Macross Frontier + Lucky Star = Moe Frontier? If you think combining Macross Frontier and K-On! is sweet, you should check out this twisted collaboration concocted by Banpresto. This unholy cross-promotion of moe and mecha is perhaps an attempt to revitalize both franchises, since anime fans consider them OLD news. 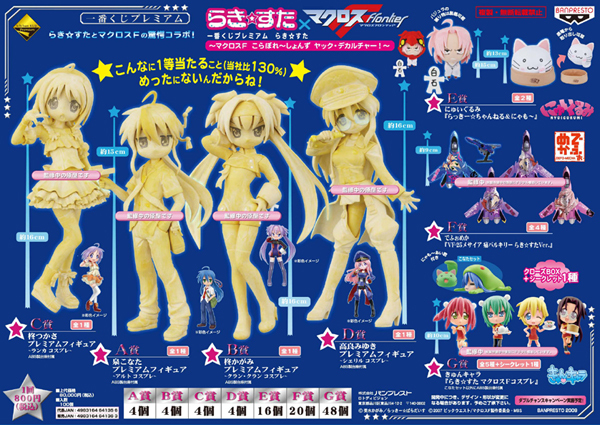 Too bad Good Smile Company didn’t jump on this, I would like to see a Nendoroid version of this crossover. Oh well, at least I’ll settle with this for now. Macross Frontier + K-On! = Sweet! This is filed under the old adage, “two great tastes, tastes great together.” Someone from Nicovideo created a video mash-up, using a K-On! modified version of the Miku Miku Dance program and Seikan Hikou from Macross Frontier. What we have here is an awesome music video. Enjoy!